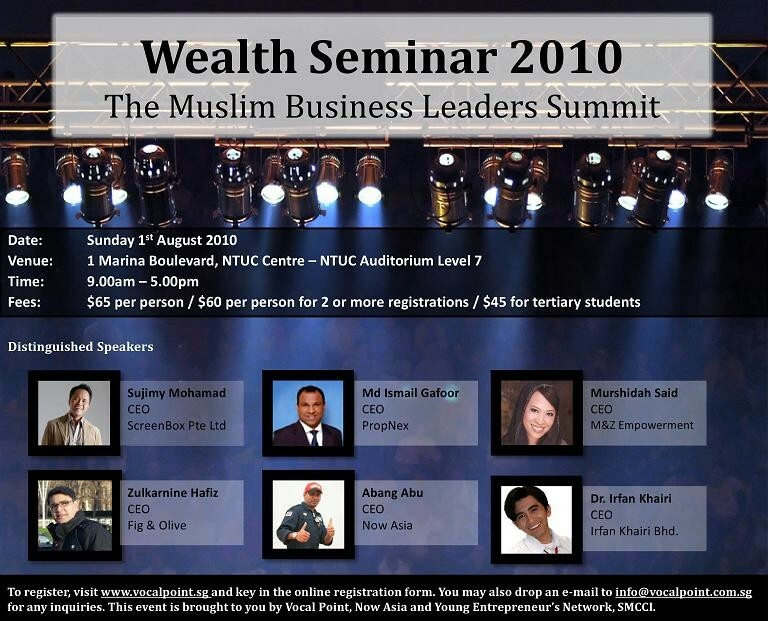 6 experienced and successful business leaders within the Muslim community will come together and share the stage on this amazing weekend. Gain insightful and valuable lessons from some of today's best entrepreneurs. Our speakers come from various backgrounds and industries to share one common thing; what it really takes to make it big in the business world. Whether you're in F&B, branding, wealth-creation, mass-media, property or the internet, you're sure to gain a lot from attending this event. You'll also be able to network with up to 500 other like-minded individuals. What are you waiting for? Don't miss this business event of the year! Sign-up today! E-mail info@vocalpoint.com.sg for any inquiries or requests. Conference fee includes notes, lunch and refreshments. Prayer room is also provided. It is recommended that participants take public transportation. Parking space in the building is charged at $3 per entry before GST. Programme outline will be e-mailed to participants after registration and payment. If we make dhikr we won't become stressed, If we are getting stressed we are not doing enough dhikr.